Old-school Outbound Marketing was often called “interruption marketing” – advertising, promotions, public relations and sales thrown at consumers whether they were interested or not. Inbound marketing, on the other hand, creates a relationship with consumers by providing interesting and useful information where they can find it or delivering it when they ask. Loyalty marketing also plays a part - brands earn the loyalty of consumers through not just rewards but also customer service and personalized experiences. Consumers express their loyalty through brand support and advocacy. Inbound marketing is a product of our increasingly digital world and there will be much more of it in the near future as consumers turn off, sometimes literally, outbound marketing efforts . Companies are taking notice, too. A Digital Donut study reveals that 63% of the businesses surveyed plan to increase their Inbound Marketing spending in 2014. Nope, it’s not a trendy area of Manhattan or a drink at Starbucks (soy low-fat mocha?) SoLoMo stands for Social-Local-Mobile and refers to the inclusion of social media, local information and mobile centric content in response to the increase in mobile device searching. All of these elements are being given more weight by the search engines in determining page rank so they can deliver a search result that is useful to the growing number of mobile search users. With mobile search expected to soar in the coming year, the format of content becomes more important than ever. Users have neither the time nor the inclination to read through a copy heavy site. Visual content – images, infographics and video – relays the message clearly and concisely making it easier for the viewer whose attention is pulled in many directions. Expect more companies to move to graphics-rich tiles on their homepages this year, mimicking the new Windows navigation scheme. And content is not the only element that will be more visual. Video ads are overtaking banner ads in popularity. Static banner ads are easy to ignore while video ads are more compelling. However, because search engines cannot interpret visual content, it is vital to optimize it to get the most SEO benefit. 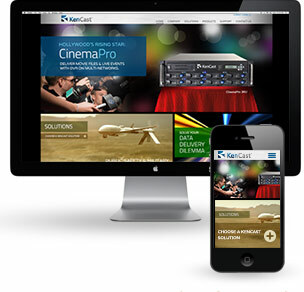 A new website we’re working on for KenCast, maker of video streaming hardware and software, will feature visual content in a tiled interface. 2014 is the year that many experts have predicted more people would access the Internet via mobile devices than via the desktop. Prospects will expect companies to have a mobile-friendly version of their website to provide quick access to the basic information they need on the go, such as location and hours. Search engines are beginning to expect this too. Recent algorithm updates such as Hummingbird are placing emphasis on mobile usability and a mobile-optimized site should receive a higher ranking than one that is not mobile friendly. But going mobile doesn’t necessarily mean having two different websites. 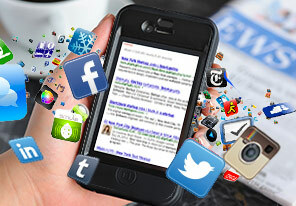 Responsive design techniques allow web developers to increase type size, remove extraneous content and stack elements on top of each other for optimize viewing on smartphones. So it’s 2014, is your site mobile friendly? Mobile-friendly versions of some of the websites we’ve launched recently, including our own. Increased emphasis by Google on Google+ may mean 2014 is the year it turns from a minus to a plus. Google is encouraging bloggers to link their posts with their Google+ profiles with the intention of establishing “expert” authors whom they can rely on when presenting search results. The more a blogger publishes (and links to a Google+ profile) the more of an expert they must be. Bloggers have already begun signing up for Google+ in droves. The wealth of data available on customers reveals a lot about them to marketers – recent searches, interests, connections, location and how best to reach them. Instead of a broad program designed to reach all potential customers, programs can now be designed to target specific sub-groups and offer something tailored perfectly for them. Customizing e-mails, promotions and advertising is not only effective in reaching people, it also is much more cost effective than in the past. My first experience with customized marketing was a coupon flyer I received in the mail from Target. Almost every single coupon was for an item I had previously purchased. A little unnerving, yes, but also effective. I used many of the coupons over the course of several visits to Target. Long gone are the days where people would watch the Super Bowl largely to see the ads. No longer can nj marketing agencies make a plan for the year and roll out campaigns and programs as scheduled. Social media allows for capitalizing on events as they are happening to grab the consumer’s’ attention when it is focused on an event. Oreo’s “You can still dunk in the dark” tweet during the Super Bowl blackout in 2013 is a perfect example and one that is remembered a year later while most of the ads have been forgotten. According to agency execs, it was conceived, designed and approved within minutes. And it didn’t cost $4 million just for the ad time. It may sound dull, but flat design is the cutting edge of web site design. Moving away from 3D graphics and dramatic shading toward a simpler look with flat colors and less cluttered layouts flat design delivers a clean and modern look for a site. Far from dull, users find the sleek layouts less distracting and much easier to navigate. 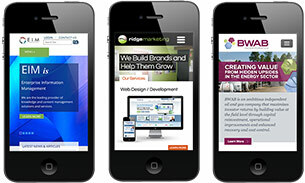 Ridge Marketing incorporated flat design in our recent website redesign – let us know what you think. The latest iOS update from Apple uses flat design, which we think is actually a response to Microsoft’s latest interfaces. People are heading in to 2014 with a better understanding of how much of our mobile and on-line activity is tracked and how vulnerable their information is. Although there has always been the understanding that the trade off for all the benefits of cell phones and Internet is reduced privacy, many people have reached the limit of their comfort. A Pew Internet study conducted in 2013 found that 86% of Internet users have taken action to conceal their digital footprint while 55% have attempted to avoid observation by governments, organizations or specific people. Expect to see a movement to more in-person, face-to-face interactions particularly in business settings as meet-ups and conventions have a revival. Consumers, too, are growing weary of companies knowing their every purchase and interest and will begin to seek out personal interactions and ways to interact with a brand. When the iPad gained mainstream adoption a few years back, many organizations dumped major time and money into developing native apps to promote their businesses. Wide distribution through the App Store was beneficial, but it often didn’t make up for significant development costs, arduous Apple approval process and time consuming updates. And the increasing popularity of the Android platform (now over 52% share in the U.S. and over 80% worldwide) means going through the process twice or missing a major share of one’s audience. 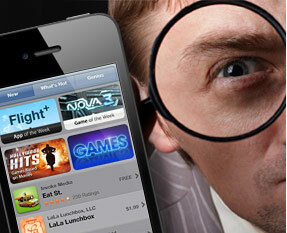 This year, we’ll see more and more companies take the pragmatic route by developing web-based mobile apps instead. Web development frameworks like jQuery Mobile have evolved to mimic tablet gestures. This makes it possible to develop graphics-rich multimedia experiences that feel like iOS and Android apps using a cost-effective web development approach. 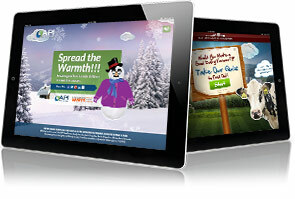 Using responsive design, one single app can function properly across the board – on tablets, phones and desktops. And updates are usually as simple as updating a web page. All of the above make it clear that effective marketing no longer requires tons of money and high visibility in mass media. It requires knowledge of the marketplace, creativity and innovation. We’ve got all that at Ridge Marketing & Design. 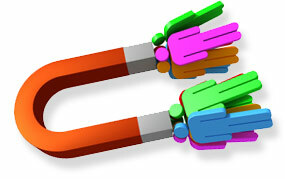 If you want an untraditional and ingenious way to reach your customers, contact us.